A re-editing of scientific left-over film footage from a solar eclipse measurement that took place 1945 in northern Finland. The film camera and sound recorder were used for the first time in history to measure the exact distance between two continents: Europe and North America. 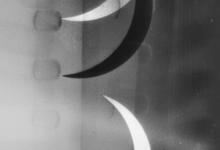 The film has two separate reels - positive («The Sun») and negative («The Moon») - which are projected simultaneously.